Please excuse the ‘lousy’ photo. I’ve gotten much at taking photos!! My new recipe for Shepherd’s Pie was a big hit last night with my “Taste Testers”, who call themselves my “Guinea Pigs”, but they never refuse an invitation to come over to try something new!! And, knowing I was going to have guests arriving gave me a good reason to FINALLY put away the last of the Christmas platters and bowls etc. which had been sitting on my dining room table for two weeks!! Onions, red wine and just a bit of tomato paste, among other things, gives this Shepherd’s Pie a bit of a “flavor boost”. On top of the beef/vegetable mixture goes creamy mashed potatoes – made with lots of butter and – surprise – an egg! So, break out your potato peeler and your oven-proof skillet, and give this recipe a try. I believe this will end up being one of your family’s favorites! 1 1/2 cups frozen peas – still frozen..
Place the peeled, cubed potatoes in a large saucepan and add just enough water to cover the potatoes. Bring to a boil over medium-high heat, cover and lower heat. Allow potatoes to simmer for about 30 minutes – or until potatoes are easily pierced with a sharp knife. While potatoes are cooking, prepare the meat/vegetable layer. In a large frying pan, add 2 Tbs. olive oil and cook chopped onions over medium heat until they become translucent – about 8 minutes. 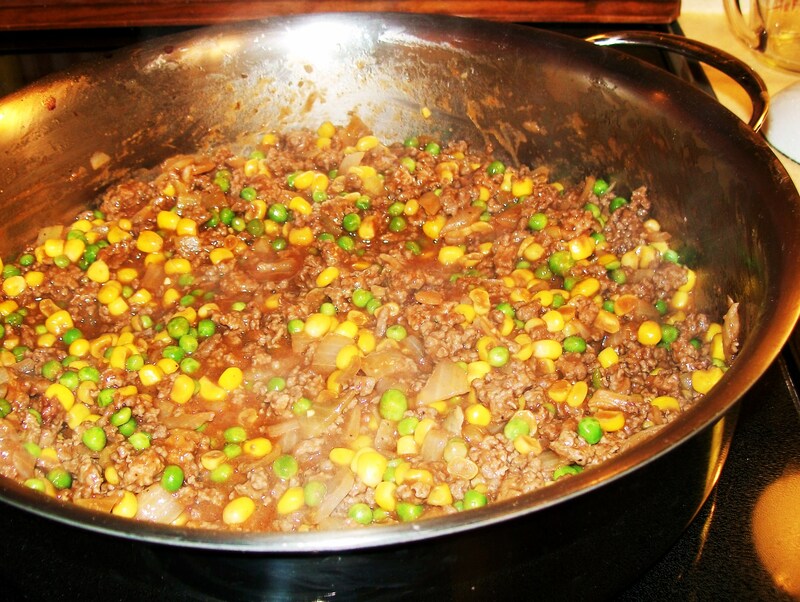 Add the ground beef and continue cooking until the meat is no longer pink. ++ As long as there’s not more than, perhaps, 2 Tbs. of grease in the pan after cooking the beef, just leave it in. Otherwise, scoop out the extra with a big spoon. Add 1 Tbs. butter and 2 Tbs. flour to the onion/beef mixture. Cook, stirring, for another 2 minutes. ++ The addition of the butter and flour helps to thicken the sauce once you add the wine and water. Add 1/4 cup red wine, 1 1/2 cups water, 1 chicken bouillon cube, 2 Tbs. tomato paste and 1/4 tsp. pepper. ++ You shouldn’t need salt, if you’ve used the Knorr cube, but taste it and see…. add some salt if you wish. Now add 1 1/2 cups frozen peas and the drained can of whole kernel corn. Continue cooking – and stirring – for another two minutes or so, until the mixture has thickened up a bit. Turn off the heat under the frying pan – and turn on your oven to 375 F.
Now it’s time to mash up those cooked potatoes. I like to start with a potato masher, then give ’em “the big, creamy finish” with an electric mixer. So, mash those ‘spuds’ down ’til there’s no more chunks. Add 2 Tbs. butter, 1/2 cup milk, 1 egg, 3/4 tsp. salt, 1/4 tsp. pepper and whip the potatoes with your electric mixer. ++ If the mashed potatoes don’t seem creamy enough, continue adding milk – up to another 1/2 cup – until the potatoes are nice and creamy. Spread the mashed potatoes – evenly – on top of the meat/veggie mixture. 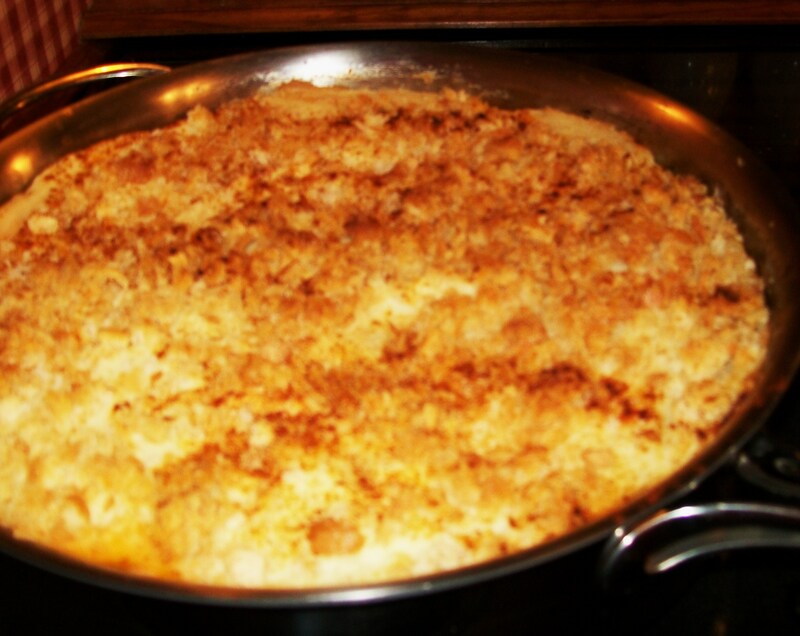 FOR THE BREAD CRUMBS – In a medium skillet, over medium heat, melt 2 Tbs. butter (I know, I know… this is NOT diet food here….) and throw in 2 cups of fresh breadcrumbs. ++ I make a bunch of fresh breadcrumbs, then put them in a zip-lock baggy in the freezer. Voila – fresh bread crumbs whenever I need them! Turn off the heat and stir until the breadcrumbs are evenly mixed with the melted butter. Sprinkle the bread crumbs over the potato mixture, and sprinkle on a bit of paprika for color. Bake at 375F for about 30 minutes. Enjoy!!! Next Post Tonight I’m Making Beef ‘n Mushroom Pie! It took me a second… I was thinking, “But it IS winter!” Then I remembered that you live in Australia – and it’s summer down there! Looks so yum! As soon as winter kicks in here I’ll definitely make it!